Hello everyone, thank you so much for signing up for our newsletter! We had a great increase in subscribers since the last newsletter went out and we want to welcome you all! As you know our mission has been to get our sacraments to anyone and everyone around the world! It has been about 2 and a half years since we started making and providing our sacraments! We initially started in the USA, then reached out to our neighbors in Canada and Mexico. Now we are proud to announce we are starting to ship one special package worldwide! Click the image to order sacraments worldwide! Our problem has always been the cost of shipping. We hate to charge anyone. so much to simply receive our sacraments, so we found the cheapest option out there to ship 1-G2kit (4 ounce bottle of HCl and MMS) so anyone worldwide can order from us! Not all of our products will be available worldwide but the G2kit has always been the most important and needed. We try to keep the cost as low as possible, so the total cost for 1-G2kit worldwide will be 40 dollars period. It is 20 dollars for the kit and the cheapest option to ship 1 package is 20 dollars from USA to anywhere in the world. At this moment we do not know how the customs in every country will process our shipment, but we believe it should make it through just about anywhere. The package is our church sacrament so it should be receivable to just about anyone. Thank you for your continued support! 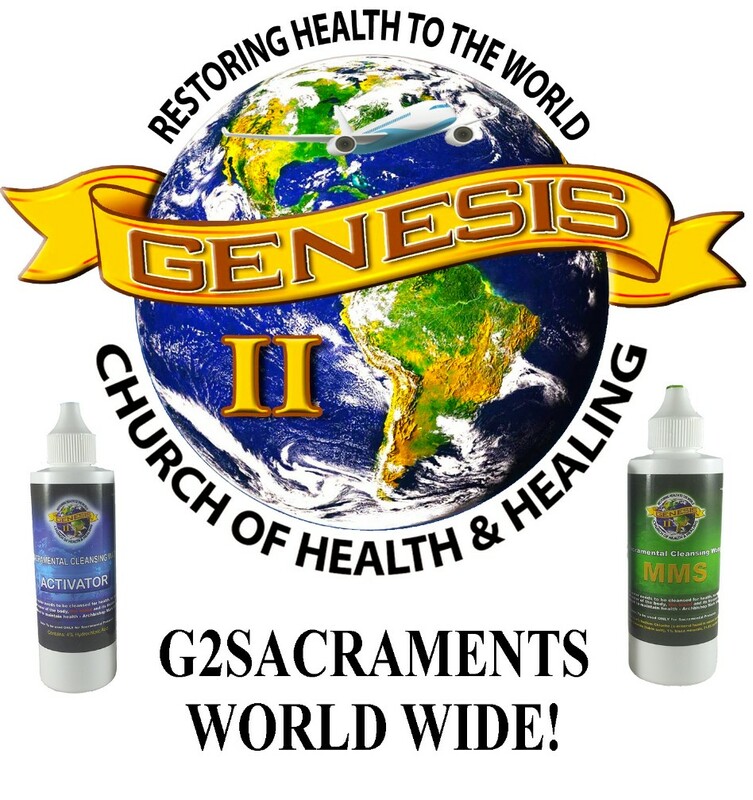 Please share this with your friends, family, and anyone worldwide to start receiving the Sacraments of the Genesis II Church of Health and Healing!